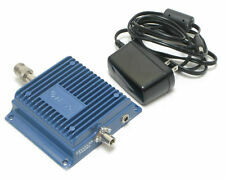 Wilson Mobile Wireless Dual-Band Amplifier 800/1900MHz PCS 824-894 FREE SHIPPING. Condition is Used. Shipped with FedEx SmartPost. CELLULAR SIGNAL BOOSTER. WILSON DUAL BAND DIRECT CONNECTION. WILSON ELECTRONICS 311155 Dual-Band 75_ Wall-Mount Panel Antenna New. Condition is New. Shipped with USPS Priority Mail. Wilson Electronics 311104 Dual-Band Omnidirectional NMO Cell Antenna 13.88"
Adjustable gain. Greatly reduces dropped calls, extends signal range, & increases data rates. Max 1,500mW output power. Overload protection circuit protects cellular towers from being overloaded. Extends battery life by enabling phone to work at reduced power. Trending at $26.87eBay determines this price through a machine learned model of the product's sale prices within the last 90 days. Wilson 811201. Cellular/PCS Amplifier. WARNING: This product contains, or may contain, chemicals known to the State of California to cause cancer and birth defects or other reproductive harm. Dual Band Direct Connection. MFG Part #: 463105. This is the NEW FCC and IC certified 2014 model; complete DIY kit. Wilson 463105 DT3G Installation Manual. More Product Information for the Wilson Electronics DT 3G Dual-Band SmarTech III - 463105. The connector is a 50 Ohm “N” connector. What you seen in the pictures is what you get. We will try to give you as much information about an item as we can. Get images that. By utilizing this system we both can see all correspondence related to a specific item. This antenna works on all cell phones 800-1900MHz - analog & digital. Local pick up is also available. It is designed for fixed installations. Designed to be installed inside of a building, and it is suitable for ceiling or wall installation. Dual Band Versatility. Works with 50 Ohm amplifiers and accessories. Dual-band 800/1,900mhz Low Profile Transferable Between Vehicles Rare Earth Magnet Easy To Install. All critical accessories related to the operation of the item will be included. MODEL 2B1401. WILSON ELECTRONICS DUAL BAND DIRECT CONNECT. SIGNAL BOOSTER. Connect to Cellular phone or Dara card. Wilson / weBoost Dual Band NMO Mount Omni Antenna | 311104. Lightning Surge Protectors. Authorized Wilson Dealer. weBoost / Wilson Signal Boosters. It's a stainless steel omni-directional antenna and features up to 5.9 dB of gain. (1) Wilson 301124 Yagi Antenna 1800/1900MHz 50ohm 13dB. (1) Wilson 2B1401 Dual Band Direct Connect Signal Booster. 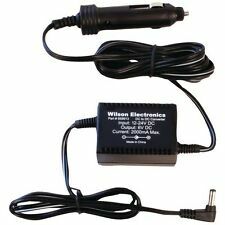 (1) Wilson 359912 Cellular Adapter w/ 971107 Female Connector. (1) Wilson 952375 75' Ultra Low Loss Cable - N Type Connector. Wilson / weBoost 75 Ohm Wide Band Wall Mount Panel Antenna | 311155. Keep in mind, this is a directional antenna so it will project only in front of it and not behind. Gain 700-800 MHz Gain: 5.2 dBi Gain, 824-894 MHz Gain: 4.4 dBi Gain, 880-960 MHz Gain: 4.2 dBi Gain, 1710-1880 MHz Gain: 10.0 dBi Gain, 1850-1990 MHz Gain: 10.6 dBi Gain 2110-2170 MHz Gain: 8.2 dBi Gain. The Wilson 859980 is a Three-way -4.8 dB Splitter that allows you to split the amplified signal with minimum signal loss to three inside antennas in similarly sized areas. Covers 700 to 2700 MHz. Three equal signal outputs. Wilson’s Mini Magnet-Mount Antennas are a low profile option and are transferable between vehicles. Rare earth magnet. Manufacturer Policy Information Wilson Electronics IMAP Policy. Battery Information Product does not require a battery. Up for sale is Wilson Eectronics Data Pro Dual Band Direct Connet (800/1900) KIT 460109 -25. Wilson Pro 460009 / U460009 Signal 3G Dual-Band Amplifier (800/ 1900 MHz). ● Compact Design that fits in constrained spaces. Wilson 301121 Dual-Band 800/1900 MHz Vertically Polarized Dome Ceiling Antenna. Condition is New. Shipped with USPS Priority Mail. 12" MAGNET MOUNT ANTENNA WITH SMA CONNECTOR. KIT INCLUDES. Wilson Cell Booster Dual Band Roof Mount RV Trucker Antenna . Condition is New. Shipped with Flat Rate Freight. One Wilson Cellular 301119 Dual Band Roof Mount RV Trucker Antenna. With spring 806-894 MHz 1850-1990 MHz.